A delightful arrangement of 24 mixed color roses will entice your loved one on any given occasion. 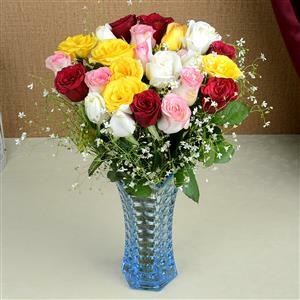 The assortment of roses are coupled with a lots of gysophila and are nicely arranged in a glass vase. Shop with us and send these gifts to India. Through RGCards.com sending Gifts to India is safe and secure. Let the deepest thoughts of your heart be rightly upheld with these gifts.